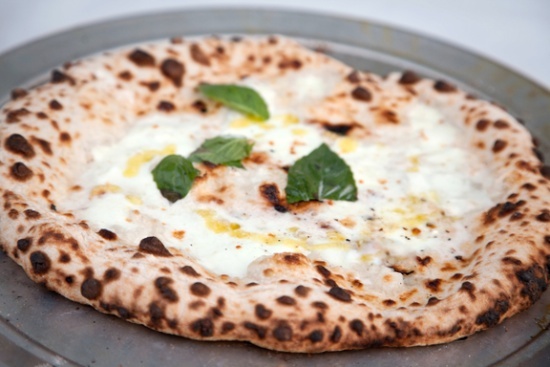 How cool is it to walk up to a 1952 Chevy Pick-Up truck and order a perfectly prepared Napoletana pizza, with great ingredients imported from Italy, prepared by a classical trained Italian chef, and baked in under two minutes in a blazing hot, wood-fired oven. Pizza Luca, the brain child of Chef Dean Medico, creates pizza masterpieces that are steeped in the tradition of Italy, using only the best ingredients from Italy to create three distinctly southern Italian pizza delicacies, the Marinara, the Margherita, and the sauce-less Bianca. When CTbites sat and discussed Chef Medico’s pizza, he passionately explained that great pizza is “all about balancing the flavors including sweet, salty, sour and bitter” and Chef Medico takes his ingredients and baking methods seriously. He completely adheres to the guidelines set by the Associazione Verace Pizza Napoletana (the association of true Neapolitan pizza), creating his dough from Caputo 00 flour, and topping each with imported San Marzano D.O.P. certified tomatoes and buffalo milk mozzarella from Capagna. The San Marzano tomatoes create the essence of the pie with the perfect balance of acidity and sweetness and the mozzarella di buffalo adds a delightful creaminess. The menu currently includes three varieties including its simplest Marinara that includes D.O.P. San Marzano tomatoes, extra-virgin olive oil, oregano, fresh garlic, fresh basil and Sicilian sea salt; the Margherita that adds mozzarella di buffalo, plus a Bianca, a tomato-less pie with Mozzarella di bufala, extra-virgin olive oil, fresh garlic, fresh basil, Sicilian sea salt. When a fourth option is added to the menu look for the Filetti, another sauce-less pie but brings tomato sweetness with the addition of fresh cherry tomatoes to the Bianca. Pizza Luca is currently dividing time between the Katonah and Bronxville Farmers’ markets, but this rolling pizzeria is available for private parties in Fairfield County and Chef Medico is discussing a third truck that may bring his creations to Fairfield County Farmers’ markets next year. And for those looking for a sneak peak / taste, CTbites is pleased to announce Pizza Luca is now making appearances at the Harbor Point Beer Garden in Stamford. Find Pizza Luca on Facebook for location on where to find the truck and general information.